Introduction – Halavagalu is a small town in Davanagere district of Karnataka. This town goes unnoticed by many of the regular tourists as there is not much of interest except remains of a single temple. Though it is the only temple of interest here, however from archaeological point of view, this temple is a curious piece of study. Kalleshvara Temple – The temple consists of a garbhagrha (sanctum), antarala (vestibule) and a mandapa (hall). the temple faces east and the entrance is provided through the southern end of the mandapa. With two additional square bays added to the mandapa, on its northern and southern sides, the temple can be put into the category of trikuta style temples. The additional bays on northern and southern sides are without any antarala and directly connect to the common mandapa. The garbha-griha, on the west, connects to this common mandapa through an antarala. The garbha-griha on west is square in plan and has a shiva-linga inside. Its doorway is very simple structure with Gaja-Lakshmi on its lalata-bimba (lintel center). The antarala does not have a doorway, thus is an open antarala. The northern cella has an image of Vishnu, which can assigned to twelfth century CE. The Vishnu image has a prabhavali depicting his ten incarnations. The cella on the south has many loose sculptures. The temple is situated in a residential area and many houses have cropped up around this preserved monument. Alexander Rea, who described this temple in 1896 CE, did not mention any remains of the shikhara therefore it may be conjectured that the shikhara has been lost long before. The earliest inscription, found here, is dated in 1282 CE and mention donation to the God but no mention of the temple construction. Foekema assigns the temple to the end of tenth century CE while the Vishnu image inside to twelfth century CE. Patil mentions that the inscription found on one of the face of the mandapa pillar was unpublished however it mentions a grant or donation towards the temple. Robert Sewell mentions that the inscription no 1 of this article was in an ancient Shiva temple inside a fort. He did not mention any other temple at the village. Hence it is very probable that his Shiva temple inside a fort is same as present Kalleshvara temple and there was a fort at this place by the end of nineteenth century CE. On a slab set up in the Kalleshvara temple – South Indian Inscriptions vol IX, no 380 – dated in Saka 1204, corresponding to 1282 CE – The record belongs to the reign of the yadava king Ramachandraraya, who is described as the rescuer of the earth from the depredations of the Turushka, the conqueror of the Hoysala soverignty etc. It registers the grant of plot of land at Haluvagalu to the Sthanika Jogarasi for the service of the god Kalinatha in the village made by Vasudeva, the chief of the village, Nacharasa, the eight Hittu and other people. The gift was made under the orders of Pavasariya, Harideva, the Adhikhari of Pandya-nadu and a subordinate of the Sainyadhipati Mahapradhana Kannaradeva, who was governing all the desas including Huligere. It also records gifts made by the Nakharas and Mummuridandas for the same god. On a hero-stone set up in the Kalleshvara temple – South Indian Inscriptions vol IX, no 385 – dated in the 18th year of the reign of the Yadava king Ramachandradeva, corresponding to 1287 CE – It seems to record the death of Semjiya-mallaya with laurels of victory in a battle field. On a slab set up in the courtyard of the Anjaneya temple – Annual Report on Epigraphy, 1918-19, no 222 of 1918 – dated in Saka era, the year is lost – written in Kannada script – probably registers the terms of a lease (cowl) in respect of a shop built in Haluvagilu. Mentions, Mahanayakacharya Basavappa-Nayaka of Baguli and his mother Nichchavva. On a slab set up in the courtyard of the Anajaneya temple – Annual Report on Epigraphy, 1918-19, no 223 of 1918 – dated Saka 13, corresponding to 1388 CE – Records that the Aivole (settis) and the mummuri-dandas of the several places like Hastinavati, Holekere, Harihara, Bada, Hemavati, Karnapura, Behuru-hadagali in the Pandu-nadu set up a Nandi-pillar in the santé-pete (market place) in Haluvagilu. How to Reach – Halavagalu is located 29 km south-west of Harapanahalli. It is tagged in Google Maps therefore you will face no issues reaching to the town. You may reach here via bus from Harapanahalli. Abhishankar, K (1972). Bellary District Gazetteer. Karnataka Government. Bangalore. Patil, Channabasappa S (1992). 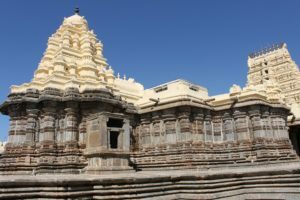 Temples of Raichur and Bellary Districts. Directorate of Archaeology and Museums. Mysore. Patil, Channabasappa S (1997). Inscriptions of Bellary District. Directorate of Archaeology and Museums. Mysore. Sewell, Robert (1882). List of Antiquarian Remains in the Presidency of Madras. Archaeological Survey of India. New Delhi.